Historically, WestGrid was governed by institutions in Western Canada that paid a membership fee and received funding through the Canada Foundation for Innovation (CFI) Major Science Initiatives (MSI) program. 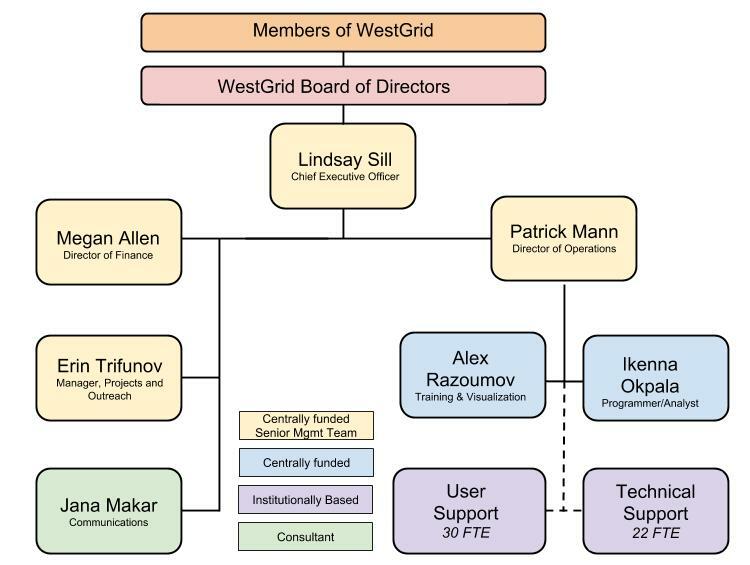 However, in 2016, WestGrid’s Member Council voted unanimously to move forward with WestGrid’s incorporation after a thorough investigation of various options. Compute Canada expressed support for this path as it ensures the risk for the region is managed separately, governance and representation for the region is inline with the other regions, and WestGrid is better able to set and manage its own regional priorities and partnerships. On February 9, 2017, WestGrid became a Canadian not-for-profit organization, with an applicant board and membership of three independent individuals. On January 17, 2018, the WestGrid Members and Applicant Board elected the organization's inaugural Board of Directors. View our 2018 AGM and Stakeholder Report summary slides HERE. The Directors are legally responsible for the organization, and will guide the organization based on the advice of the Members, in the best interest of the research community. Dr. Hepburn is a highly respected researcher and accomplished university leader. During his decade long service as VP Research and International, he was influential in building the capacity of UBC’s research portfolio and creating new institutional partnerships in China and around the world. His previous positions at UBC include Dean of the Faculty of Science and Head of Chemistry. He is also a former Canada Council Killam Research Fellow and a Fellow of the Royal Society of Canada. 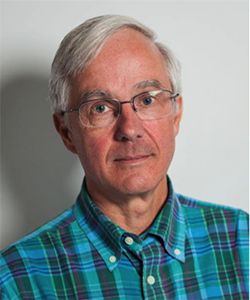 Dr. Hepburn has a PhD in Chemistry from the University of Toronto and completed his undergraduate Chemistry degree at the University of Waterloo. He was a Professor of Chemistry and Physics at Waterloo between 1991 and 2001. Over a distinguished career, Hepburn has received a number of honours and awards, including the Rutherford Medal in Physics from the Royal Society of Canada, Elected Fellowships in the American Physical Society and the Chemical Institute of Canada, and an Alfred P. Sloan Foundation Fellowship. He has supervised more than two dozen graduate theses and authored more than a hundred peer reviewed publications. 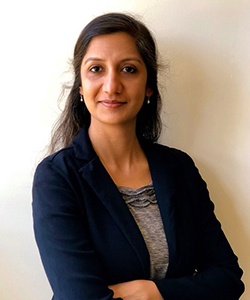 Rachana Ananthakrishnan is Head of Products at the University of Chicago, and has a Joint Staff Appointment at Argonne National Laboratory. She leads the engineering, product design and product management functions for Globus, which delivers research data management solutions to research institutions. As part of the Globus leadership team, she develops strategic plans and initiatives, and ensures growth and sustainability of the project. She is focussed on research and education mission, and has worked on security and data management solutions on various projects including Earth System Grid (ESG), Biomedical Informatics Research Network (BIRN) and Extreme Science and Engineering Discovery Environment (XSEDE). Prior to that she worked on the Globus Toolkit engineering team and customer engagement teams, leading the efforts in core web services and security technologies. She received her MS in Computer Science at Indiana University, Bloomington. Jay Black is a retired professor of Computer Science, and has been CIO at both Simon Fraser University and the University of Waterloo. He has been an active participant in strengthening digital research infrastructure (DRI) in Canada, as Chair of the Board of BCNET, and as a founding co-chair of the Leadership Council for Digital Research Infrastructure, a national coalition of institutions, individuals, and organizations dedicated to improving the Canadian DRI ecosystem. Jay has been serving on the Applicant Board of Directors for WestGrid since February 2017. Dean Chapman is Science Director at the Canadian Light Source, Canada’s national light source in Saskatoon, SK. Chapman completed a PhD in Physics at Purdue University in 1981. He spent several years at the National Synchrotron Light Source at Brookhaven National Laboratory (1982- 1995) as a beamline scientist on materials science and medical research facility beamlines. In 1995, he moved to the Illinois Institute of Technology (IIT) in Chicago to help direct IIT beamlines at the Advanced Photon Source, Argonne National Laboratory. In 2003, he came to the University of Saskatchewan as a professor in Anatomy and Cell Biology where he was the scientific lead of the Biomedical Imaging & Therapy (BMIT) project at the CLS. At the university, he has held a Canada Research Chair in X-ray Imaging (Tier 1) for over 10 years. 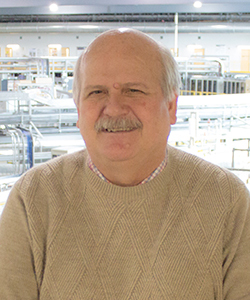 Chapman is a board member of the Canadian Institute for Neutron Scattering, and a Regional Councillor for the Canadian Association of Physicists. He holds seven patents on various x-ray optic developments, and was involved in three startup companies (founding member, VP, and Chief Scientific Officer) over his career. J.P. Heale has worked at University-Industry Liaison Office (UILO) at The University of British Columbia since 2001, most recently in the capacity of Managing Director. The UILO is an organisation of 28 people who are responsible for the commercialization of University research and also negotiating research contracts between the University and industry, not-for-profit, and government entities. Every year the UILO generates $7 million in revenues from licensing and liquidated equity, and executes $160 million in research contracts. J.P. graduated from UBC in 1997 with a doctorate from the Department of Biochemistry and Molecular Biology from UBC, and subsequently worked as a Post-Doctoral Fellow and Research Associate. 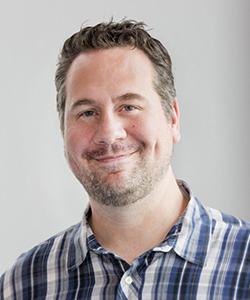 J.P. received an MBA from Simon Fraser University in 2001 while working as Manager of Business Development for a UBC spin-off biotech company. In 2001, J.P. joined the UILO and took on the role of Managing Director in 2014. J.P. is member of the Association of University Technology Managers (AUTM), and Life Sciences BC. 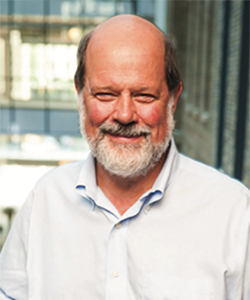 He is a grant reviewer for CIHR committees, a member of the Research Advisory Council for Cystic Fibrosis Canada, Chairs the UBC Technology Equity Management Committee, and is a Board Member for WestGrid and Paragon Testing. Rainer Iraschko holds a BSc in Electrical Engineering from the University of Toronto and a PhD in Electrical and Computer Engineering from the University of Alberta. Upon graduation in 1997 Dr. Iraschko joined MCI's Network Technology Development group in Dallas, Texas, where he investigated and enhanced the resiliency of MCI's transport network. Later that year he moved to Silicon Valley to launch ONI Systems, where as Senior System and Network Architect of ONI’s optical transport platform he helped ONI grow into a public company with a market capitalization in the billions. 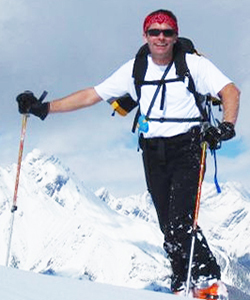 In 2001 he was recruited to open a software development office in Calgary Canada for another start-up - Network Photonics Inc. After the demise of Network Photonics with the implosion of the telecom bubble, Rainer joined TRLabs as VP Research - a not-for-profit organization fostering industry growth through ICT innovation. Five years later when the government stopped funding TRLabs, Rainer joined Eclipse Geomatics & Engineering Limited as a consultant in the design, construction, and maintenance of not only fiber optic networks, but also SCADA, wireless, and sensor networks for Alberta’s utilities and oil & gas sector. In 2014 Rainer Iraschko rejoined TELUS as a Principal Technology Architect (PTA), a role he continues to hold to this date. 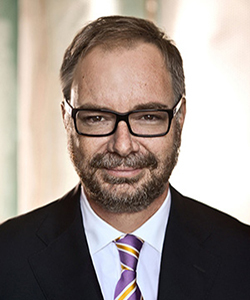 As PTA, Rainer is responsible for identifying emerging ICT trends and fostering the development of technologies of interest and relevance to TELUS. 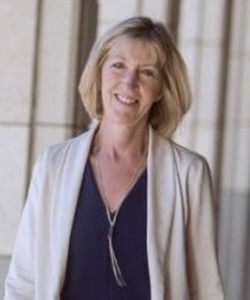 Ruth Marinshaw is CTO for Research Computing at Stanford University, leading the Stanford Research Computing Center (SRCC). Jointly sponsored by the Dean of Research and the Associate Vice President for IT Services, the SRCC engages with research teams and technologists across a wide spectrum of disciplines, supporting a growing portfolio of research technologies and cyberinfrastructure services. With more than 25 years of experience in management and technology leadership at research universities, Marinshaw is especially interested in extending the potential of high-end computing to research areas whose needs cannot be met by traditional HPC solutions. 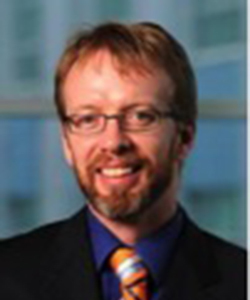 Marinshaw is an active member of the Coalition for Academic Scientific Computation, serves on the HPC-PAG at Internet2,is on the Pacific Research Platform Advisory Board, and is an advisor to Sylabs.io. She also serves as a Campus and Regional Champion for the NSF XSEDE program; her team manages the XSEDE-allocated GPU cluster, XStream. 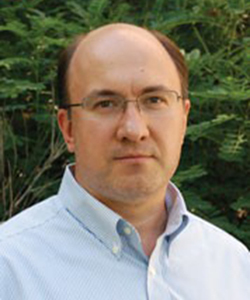 Sergei Noskov was the most recent Chair of the WestGrid Executive and is a Full Professor of Molecular Biophysics in Centre for Molecular Simulation at the University of Calgary. He received his PhD in Physical Chemistry from the Russian Academy of Sciences followed with research positions at the Cornell University Medical College and Institute of Molecular Pediatric Sciences at the University of Chicago. His research focuses on Molecular Modelling, Membrane Proteins (Ion Channels and Ion-coupled transporters), Quantum Chemistry of Biologically Relevant Molecules, Free Energy Profiles, and Protein Structure/Function prediction. Noskov is an active member of HPC community in Canada and world-wide, serving as a grant panel member for the National Academy of Sciences USA, Special Program Panel (ANTON2), and participating in the Science Leadership Council of Compute Canada. Jeff Ryzner has been helping companies successfully commercialize technology for more than 20 years. He is a founding partner of three technology startups, including HealthLink Technologies, a top-tier SaaS solution for healthcare facilities in North America. Jeff is an active mentor, working with companies of all sizes, all over the world. His volunteer work with Futurpreneur earned him the award for Manitoba Business Mentor of the Year in 2011 and the BDC Business Mentorship Award for Canada in 2015. While President of North Forge Technology Exchange, Jeff ied a winning team that introduced numerous new programs and resources accessible to entrepreneurs all across Manitoba. In 2016 Jeff accepted both the prairie regional and national awards for Entrepreneur Support from Startup Canada. Prior to joining North Forge Technology Exchange, Jeff served as president of The Eureka Project, Manitoba’s largest and most successful technology incubation program.